Flounder has always been one of the mister’s favorites. If you stuff the flounder you win mega wife points. If you find flounder on sale…even better! I will apologize now for the pics, or lack thereof. 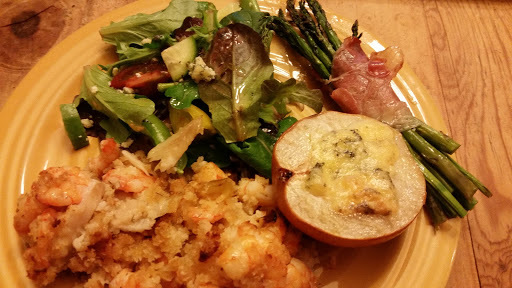 At one point, I thought I had really messed up and overcooked the shrimp. One thing I cannot stand is overcooked shrimp! Surprisingly, this turned out very well, so I’ll share the recipe with you. Peel and devein the shrimp. Reserve the shells for your shrimp stock. Pat the shrimp dry with paper towels, add salt and pepper to taste, and place in the refrigerator until ready to use. Prepare the shrimp stock. You can see my method here. Melt 3 tablespoons of butter in a large saute pan. Saute the onion, celery, and pepper, until tender. Add the shrimp and cook until pink but not completely done. It will finish cooking in the oven. When the shrimp are pink, add the dill, Worcestershire sauce, red pepper flakes, and shrimp stock. Stir until thoroughly combined. Remove from heat and add the Panko bread crumbs, mixing well. 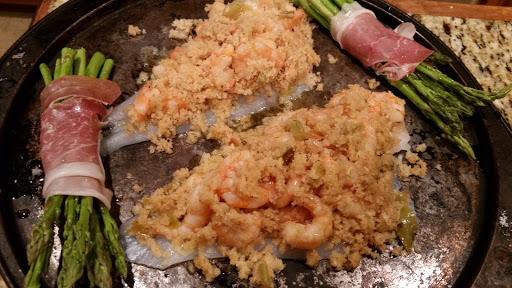 Place the flounder filets on a baking pan with a small lip (I used a pizza pan) and mound 1/4 of the shrimp mixture on each filet. You can roll the fish if you prefer, but I chose not to do that. Melt the remaining butter and add the lemon juice. Spoon over the filets. I was trying to avoid more dirty dishes and it worked! Bake in a 375 degree oven for 20 minutes or until the fish is cooked.